2015 College GameDay: Most-Watched, Highest-Rated Regular Season Since Show Expanded; Most-Streamed Season Ever on WatchESPN - ESPN Press Room U.S.
1 Nov. 28, 2015 2,267,000 Stillwater, Okla.
2 Nov. 7, 2015 2,233,000 Tuscaloosa, Ala.
4 Nov. 1, 2014 2,184,000 Morgantown, W.Va.
5 Nov. 15, 2014 2,178,000 Tuscaloosa, Ala.
7 Oct. 3, 2015 2,144,000 Clemson, S.C.
1 Oct. 3, 2015 46,000 Clemson, S.C.
2 Sept. 19, 2015 43,000 Tuscaloosa, Ala. Overall, per episode, WatchESPN saw a growth of 77% in average minute impressions, 65% in total users, and 75% in total minutes viewed compared to the 2014 regular season. Fifteen weeks, it went by so fast my friend. Oh Did We Really See That? 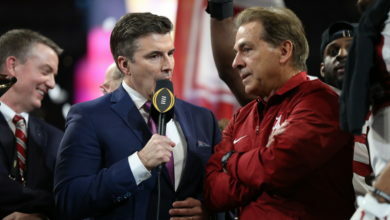 Rece Davis concluded his first season as host of College GameDay in 2015. Each week he was joined by analysts Kirk Herbstreit, Lee Corso, Desmond Howard and David Pollack, as well as contributors Samantha Ponder, Tom Rinaldi and Gene Wojciechowski. College GameDay will be onsite for the College Football Playoff Semifinals and the National Championship Game Presented by AT&T. Full details will be announced soon.